Firefly leading man Nathan Fillion has urged fans to support him in his bid to headline the film adaptation of Naughty Dog's Uncharted: Drake's Fortune. Few actors command geek heartstrings in the way that Nathan Fillion does. He was the star of the beloved Firefly, and the antagonists of the final season of Buffy the Vampire Slayer and Dr. Horrible's Sing-Along Blog. He was Sgt. Buck in Halo 3: ODST, and he's been rumored to be the front-runner for the role of Ant-Man in the Avengers movie. Now, he may have the chance to add yet another "geeky" role to his credits: Nathan Drake, the charming leading man of Naughty Dog's popular Uncharted games. "If ever there was a Twitter campaign, let this be it. Rise, ye Browncoats. Rise, ye Castillions. RISE! http://j.mp/aEGe79"
In other words, Nathan Fillion wants to play Nathan Drake, and he wants his Firefly and Castle devotees to lobby Columbia Pictures to cast him in the role. I am completely in favor of this. 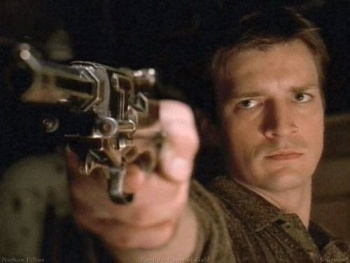 As seen in Captain Mal Reynolds, Fillion has the Indiana Jones/Han Solo/John McClane/Tintin act down cold. Sure, he might not sound like the Nate Drake we all know and love, but eh, maybe they can just get Nolan North to do the dub voicing. That they share the same first name - double Nathan all the way, across the sky! - is just extra icing on this particularly sweet cake.